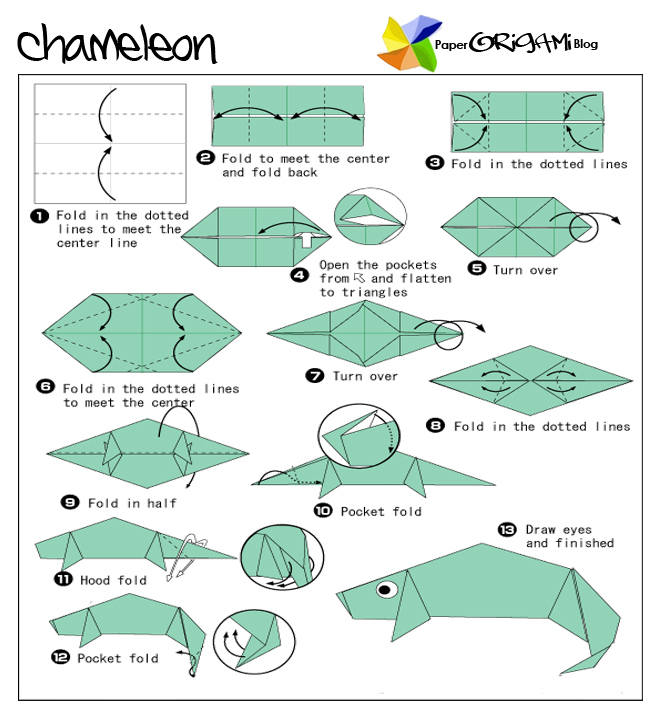 Animals Origami: ChameleonChameleons (family Chamaeleonidae) are a distinctive and highly specialized clade of lizards. They are distinguished by their parrot-like zygodactylous feet, their separately mobile and stereoscopic eyes, their very long, highly modified, and rapidly extrudable tongues, their swaying gait, the possession by many of a prehensile tail, crests or horns on their distinctively shaped heads, and the ability of some to change color. Uniquely adapted for climbing and visual hunting, the approximately 160 species of chameleon range from Africa, Madagascar, Spain and Portugal, across south Asia, to Sri Lanka, have been introduced to Hawaii, California and Florida, and are found in warm habitats that vary from rain forest to desert conditions.